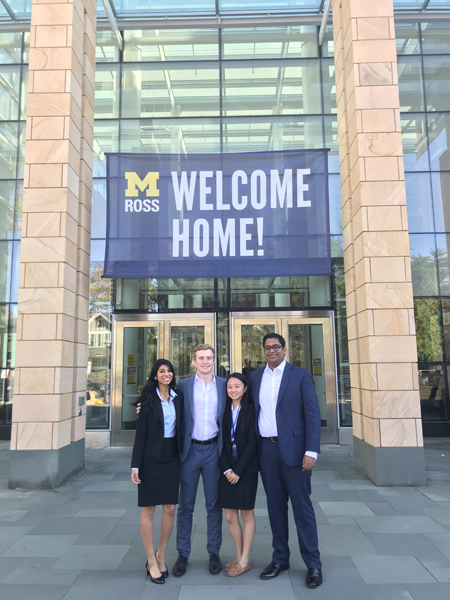 This weekend, a team of four BHP University Securities Investment Team (USIT) students traveled to the University of Michigan Ross School of Business to compete in one of the oldest undergraduate stock pitch competitions, hosted by the Michigan Interactive Investments Team . USIT has historically done very well at this competition (3rd in 2016, 1st in 2014), and this year the team was thrilled to clench 2nd place! The team, comprised of Karna Venkatraj (BHP Junior, USIT Industrials Portfolio Manager), Ryan Spencer (BHP Junior, USIT Energy Fund Analyst), Catherine Cheng (BHP Sophomore, USIT Senior Analyst), and Ananya Rajesh (BHP Sophomore, USIT Senior Analyst), beat out 25 teams from other top business schools. Stock pitch competitions allow teams of students to formulate a variant view revolving aroung a particular security, conducting intrinsic and relative valuation to arrive at an implied valuation for the company. Students then present their findings to the competition judges in a preliminary and final round. This year, the team chose to pitch Hawaiian Airlines. The four students on the team are leaders within the University Securities Investment Team (USIT), an investing team that seeks to provide financial education through active securities investing. USIT is the only UT finance organization to send teams to national competitions. The organization also boasts and all-female executive board, including two BHP students serving in the roles of President (Phoebe Lin) and Director of Investment (Megan Tran-Olmsted). This entry was posted in News, Program News and tagged Ananya Rajesh, Catherine Cheng, Karna Venkatraj, McCombs USIT, Ryan Spencer, stock pitch competition, Texas BHP. Bookmark the permalink.